How to design a website for mobile devices (smart phones). Next web world with smart phones so start working on mobile templates. In this post I want to explain very basic HTML design tip with adding a meta tag. 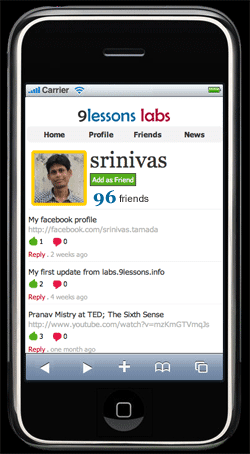 I had implemented this at touch.9lessons.info, try to access this link with any smart phone Eg: Iphone and Android devices. Can you please tell me any online simulator for iPhone? nice post .. anyway any online emulator for iPhone viewer or else? Well explained design post for mobile device..
How to Use CSS3 Media Queries to Create a Mobile Version of Your Website? Thanks for the site its awesome site for the visitors. Good advice. We often advise our students to take a step back and understand what they are getting into. This article reinforces that concept with some practical advice. This is really a nice blog i like to read this blog daily it has got all the informative stuff that i want to know about. i want to subscribe it so can tell me when your blog gets updated. Nice and very cool article.But it work in wml supported mobile phone? Keep it up! Good topic was explain related to daily life. In this clear the ideas to solving the problems in our life then I like to add my bookmark also subscribe it..
Is there any different limit of meta tags for mobile website or its same as of desktop browser...? it is very cool. I have one question is it the same way that facebook did his downloadable mobile application?????? Do you know any chat application for mobile websites? Basic HTML design tip with adding a meta tag. 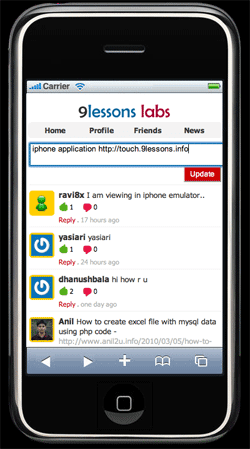 Implement this at touch.9lessons.info, try to access this link with any smart phone Eg: Iphone and Android devices.